Monroe sings the song surrounded by well-dressed men. The song is perhaps most famously performed by Marilyn Monroe in the 1953 film Gentlemen Prefer Blondes. Monroe's character, Lorelei Lee, has been followed on a Transatlantic ocean liner by a detective hired by her fiance's father, who wants assurance that she is not marrying purely for money. He is informed of compromising pictures taken with a British diamond mine owner and cancels her letter of credit before she arrives in France, requiring her to work in a nightclub to survive. Her fiance arrives at the cabaret to see her perform this song, about exploiting men for riches. Diamonds are an element in another story line in the film, in which Lorelei is given a diamond tiara by the mine owner, in gratitude for her recovering the photographs. In a later scene, Jane Russell, who played opposite Monroe, sang "Diamonds Are a Girl's Best Friend" in court, while pretending to be Lorelei. Most of the song in the film is Monroe's own voice but she needed help in two phrases – "These rocks don't lose their shape, diamonds are a girl's best friend", and at the beginning with a series of high-pitched "no's", all of which were dubbed in by the soprano Marni Nixon. The number was later re-shot in CinemaScope, to be used as part of a CinemaScope demonstration held on the Fox lot in March 1953. Producer Darryl F. Zanuck told "Daily Variety" that it only took 3-1/2 hours to shoot the number in CinemaScope versus four days for the original film version. The public finally saw the CinemaScope version ten years later when it closed Fox's documentary tribute to Marilyn, however this has not been released on DVD or VHS. Monroe's rendition of the song has been considered an iconic performance and has since been copied by other entertainers ranging from Madonna and Kylie Minogue to Geri Halliwell and Anna Nicole Smith. Madonna's video "Material Girl" uses a similar set and costumes for the singer and her male dancers. The song is also featured in the 2001 film Moulin Rouge!, in which it is sung principally by Nicole Kidman in the role of Satine, the (fictional) star performer of the famous Moulin Rouge nightclub in Paris, at the turn of the 20th century. This film version is technically a musical adaptation that director Baz Luhrmann titled "Sparkling Diamonds". 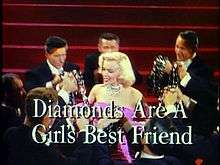 Although it consists almost entirely of an adaptation of "Diamonds Are a Girl's Best Friend", this version differs from the lyrics in Gentlemen Prefer Blondes in several ways. For example, it does not include the name Harry Winston in the chant of famous jewelers; rather, Moulin Rouge founder Charles Zidler's name was changed to Harold in the film, so his name replaces Winston's in the song as "Harry Zidler". Black Starr & Frost-Gorham was known by that name only after 1925, but instead of using their 1875-1925 name of "Black Starr & Frost", their name was replaced in the Luhrmann film by nonsense words (understood by many listeners as "Ross Cole;" in the 2002 DVD release, the words printed in the text captioning are "Black Star, Roscor"). And the potentially anachronistic line "help you at the Automat" was altered in the Luhrmann film to "help you feed your pussycat." Additionally, a lyrical snippet from Madonna's song "Material Girl" was worked into this adaptation of the song. Ethel Merman recorded the song in 1950. Lena Horne recorded the song in 1958 for her album Give the Lady What She Wants. Della Reese recorded the song in 1960 for her album "Cha Cha Cha". Julie London recorded the song in 1961. Eartha Kitt recorded the song in 1962. Emmylou Harris recorded a country/rock version in 1983 for her album White Shoes. Thalía performed this song in 1991 on Spanish television. Jennifer Saunders and Dawn French, dressed as Marilyn Monroe and Jane Russell, parodied the number in their 1993 BBC special "Gentlemen Prefer French & Saunders". Kylie Minogue performed this song in 1995. In 2007 she recorded another version for her film White Diamond. She also performed the song in 1999 dressed as Monroe for the opening of 20th Century Fox's Australian Studios. In 2007, Beyoncé did an updated version for Giorgio Armani's new fragrance Emporio Armani Diamonds in an ad directed by Jake Nava and titled "Can You Resist?". Wendi Peters performed a version for BBC Children in Need on November 16th, 2007, adding "I am a Material Girl" halfway through, then returning to the normal song. Nicole Scherzinger performed a version for the 2007 CBS special, Movies Rock, which paid tribute to the strong relationship between films and music. T-Bone Burnett's rock version of the song is both campy and cynical, while capturing the essence of the lyric. Nadine Coyle recorded a demo for this song. Deanna & The Downbeats, a cabaret-jazz quintet from Portland Oregon, performs a traditional version of the song that segues into a lounge-swing version of Madonna's "Material Girl". In the cartoon Hey Arnold!, Helga's mother sang "Beepers Are a Girl's Best Friend" for a commercial in the same manner as Marilyn Monroe's performance. In the 100th episode of Gossip Girl titled "G.G. ", Serena Van der Woodsen portrayed by Blake Lively has a dream in which she is Marilyn Monroe and sings "Diamonds Are a Girl's Best Friend". The scene in which Marilyn Monroe sings the song is emulated in Madonna's song "Material Girl". Christina Aguilera also did the song on her first featured film Burlesque. Kristen Bell and Julianne Hough first lip-synched Marilyn's version then Christina finished it with her own vocals. The song is performed by Nicole Kidman in the film Moulin Rouge. The song is performed by the female Glee Cast in the TV show Glee in 2013 in the episode "Girls (and Boys) On Film" as a mashup with Madonna's "Material Girl". ↑ Prial, Frank J. (March 6, 2007). "Voice of the Many, but Rarely Herself". New York Times. Retrieved 2009-04-20. ↑ "AFI's 100 YEARS...100 SONGS". American Film Institute. Archived from the original on 2007-10-27. Retrieved 2008-02-19. ↑ Derschowitz, Jessica (January 20, 2012). "Blake Lively channels Marilyn Monroe on "Gossip Girl"". CBS News. Retrieved January 31, 2012.